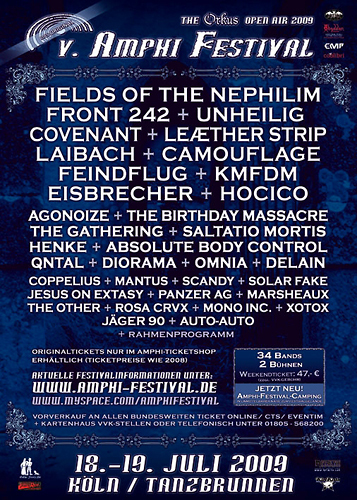 Negative points: Ok, I learned that the AMPHI organizers can’t do anything against it, but this area has its own catering and these dudes know how to get rich on these both days. Food and drinking prices were exorbitant! Really! Pizza, Chinese food for 6 Euros??? Bratwurst with bred 3 Euros; beer 4 Euros… pfffffff. Of course it is not allowed to bring any drinks or food on the festival area. Second point are the stage times. If you are a fan of sequent bands you can be sure that you cannot see them in its entirety coz of intersecting stage times. I personally hate it when bands play at the same time on different stages or when you have to leave one band you like to see to get to the other one on time. Besides, you don’t have any buffer when things chronologically get out of hands. It happened quickly. Some musicians got stuck in jams, some overran deadlines for soundcheck and make-up and at the end we had a delay of one hour on the Theater stage… That wasn’t nice! I say: less bands and more time in-between to change stages. A festival is supposed to have a great time and to see the bands I love and is not a sprint competition. AND… I gonna repeat this: also in the Gothic and Electro scene are enough great bands to find. There is NO NEED to let the same bands play the same festival every year or every two years!